(Phys.org)—Researchers are developing a technology that could one day make paint and color packaging labels that never fade. The color is produced by a type of nanostructure called a "plasmonic pixel." These pixels are made of aluminum nanoantennas, and when the free electrons in the metal collectively vibrate at specific frequencies, they produce a specific color. In a new paper published in Nano Letters, Timothy D. James, Paul Mulvaney, and Ann Roberts at The University of Melbourne have demonstrated a new plasmonic pixel design that addresses several of the critical problems facing plasmonic color images, including a limited number of colors, small image size, and difficulty in creating accurate colors without using complex color-mapping algorithms. The new plasmonic pixel design uses an algorithm that can produce nearly 2000 different colors and shades and achieve a resolution that exceeds the resolution limit of the human eye. To demonstrate, the researchers fabricated a 1.5-cm-long image (which is relatively large compared to previous plasmonic images), and showed that colors could be accurately reproduced using a straightforward color-mapping algorithm. Although other areas of plasmonics research may have potential applications as displays for phones and TVs, this plasmonic pixel produces a static image, where the color and structure are set at the time of fabrication and can't be altered. "The potential applications for the plasmonic pixel (and other color-producing nanostructures in this research space) would be as an industrial paint on cars, buildings, advertising billboards, etc., as the plasmonic pixels will never fade," James told Phys.org. 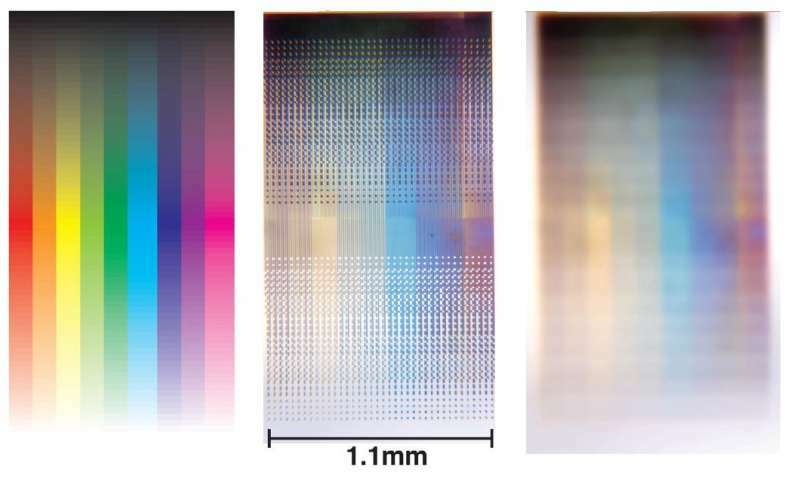 "With the ability to print at resolutions greater than conventional pigment-based processes, the plasmonic pixels may also have applications in security-based devices for use on high-value product packaging, medicines, etc." 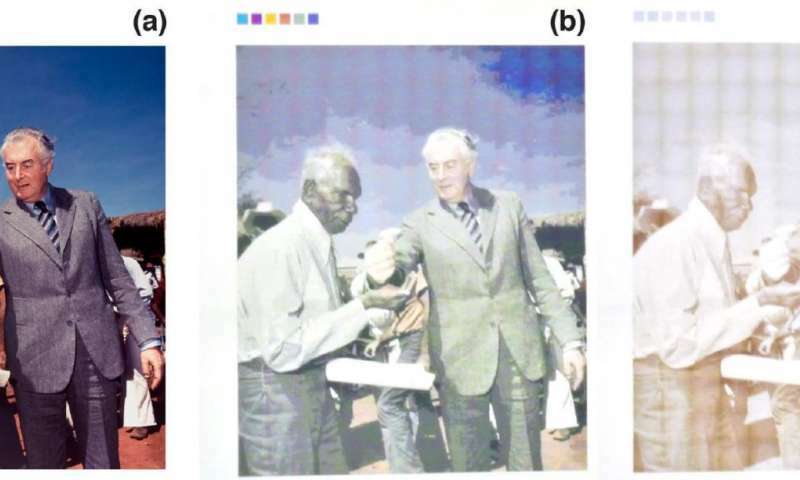 As the researchers explain in their paper, printed images are just one application of plasmonics research. Other plasmonic structures are already being used in sensors, light sources, and photovoltaics. All of these applications are based on the same general concept of plasmons, which are basically large masses of electrons that move together under an applied electric field. The most common plasmonic materials are gold and silver, but aluminum is the more practical candidate for large-scale applications because of its natural abundance and low cost. The new plasmonic pixel images are made of arrays of aluminum nanoantennas that each produce a specific color by selectively absorbing or reflecting different wavelengths of light. The length of the nanoantenna determines its color, while the gap between each nanoantenna and the substrate determines its color saturation. Another unique characteristic of the plasmonic-pixel-based image is that it is polarization-tunable. By changing the polarization, or the direction in which the light waves oscillate, the color can essentially be switched "on and off." This makes it possible to easily fabricate either color or grayscale images. The researchers plan to make further improvements to the plasmonic pixel concept in the future. "The immediate goals are further refining the algorithm to increase the color gamut and saturation, and to investigate the scaled-up fabrication of large-area plasmonic pixel devices with nano-imprint lithography," James said.